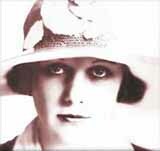 Edna Purviance Film Festival is being discussed for her birthday, October 21. Her films with Chaplin would be shown of course, and the grand finale: a screening of her post-Chaplin feature, “A Woman of Paris” with Adolph Menjou. If Linda will lead a walking tour of Edna’s Lovelock girlhood, we would have a real chance for time travel. One of the most enjoyable messages I pick out of the endless avalanche of spam is Mark Bassett‘s weekly “At The Throttle” column. Mark is an engaging writer, and “The Ghost Train of Old Ely” is a beguiling subject. Here’s an example. You’ll enjoy exploring this interesting and comprehensive website about one of Nevada’s most wonderful treasures, The Nevada Northern Railway. 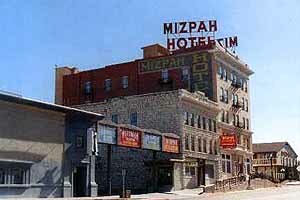 The Mizpah Hotel, flagship of old Tonopah. Speaking of wonderful Nevada treasures, the sale of the Mizpah Hotel in Tonopah has fallen through and it is back on the market. Yes there are many good alternatives to the old landmark for an overnight stay, including our website client Tonopah Station at the top of town, but nothing represents Tonopah more in the public mind than “the finest stone hotel in the desert”, as it advertised itself in 1908. Isn’t there someone with a few million at hand, a vision of the prosperous future, and a lots and lots of patience? If so, you are needed in Tonopah right away. 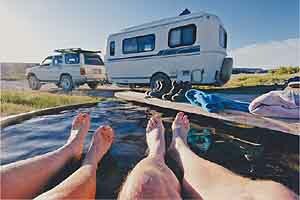 Remember that “Koolest RV Moment” photo contest from the Nevada Commission on Tourism? Carolyn Fox of Jackson California won the Grand Prize, with her photograph at Spencer’s Hot Springs in central Nevada’s Smoky Valley, near Austin. Carolyn is one of the world’s finest four-legged photographers. There’s no inertia in Nevada’s international outreach efforts. After opening an office in China, The Nevada Tourism Commission has partnered with the LVCVA and Travel Pie-Mexico International Destination Marketing to maintain the Nevada presence in our third largest visitor nation. So if you find yourself homesick in Mexico City you could stop by Alejandro Dumas No. 124 Colonia Polanco 11560 and book a flight to Yerington or Wells. 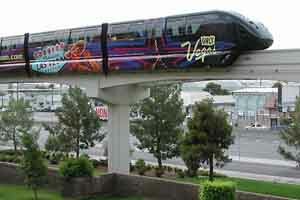 The new Las Vegas Monorail is rolling at last, the newest addition to the famous Las Vegas Strip. Gliding above traffic at speeds reaching 50 miles per hour, passengers travel the four mile route in under 15 minutes. Cost: $3 and up. 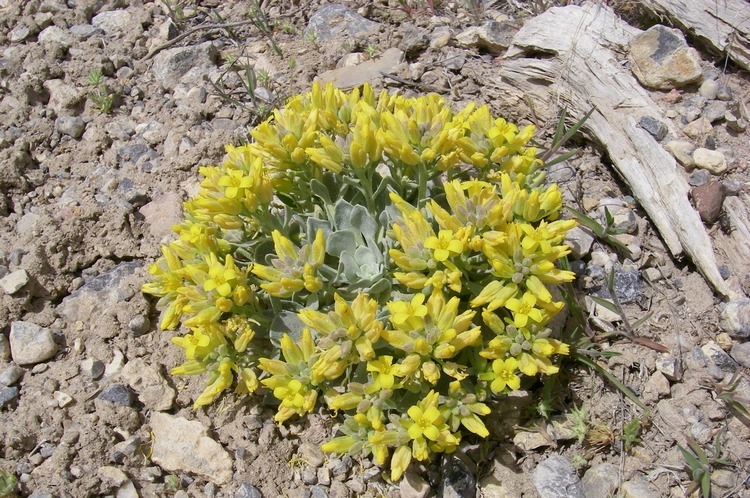 Actually, this is part of the Nevada Adventure program. By not providing bathroom facilities, the state is encouraging travelers to experience our state the way the pioneers did. Next time you make the drive, just pull off the pavement, stroll into the sagebrush, and participate in the great tradition of Jed Smith, Kit Carson, John Fremont and the wagon train emigrants. Bob has a program on KUNR on Wednesday evenings playing “The Music of America”, the perfect rebuttal to computer-managed radio programming. Last Wednesday night I was pulling up at The Cider Factory Resturant — no, that’s not a typo, that’s Swedish — in Virginia City, joining friends and family for dinner. I couldn’t get out of the car, I had to hear it all as Bob played “Abba Dabba Honeymoon” and Count Basie’s “One O’Clock Jump” back to back, the perfect haiku-sketch of an era with just two records.